In a small bowl combine the granualted sugar and ground coffee, mix well. Spoon a layer of the sugar coffee mixture onto a plate. 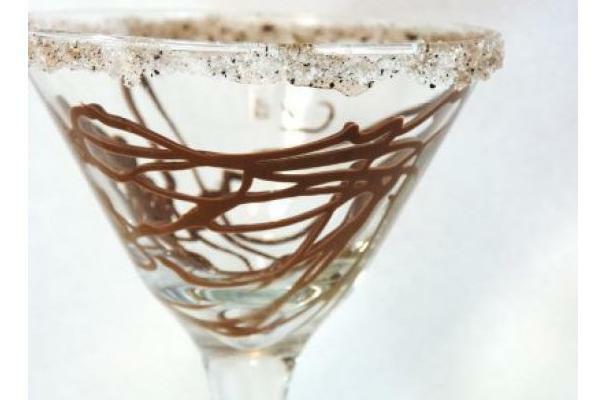 Moisten the rim of a martini glass with water, hold upside down and place into the sugar coffee ground mixture getting a nice rim on the glass. Fill a martini shaker three fouths full with ice. Add the vodka, Baileys and Kahlua, shake until condensation forms on the outside of the shaker. Drizzle chocolate syrup on the inside of the perpared martini glass. Strain the martini into the glass and serve immediately.